I absolutely love the cooler weather we have been having. Rain and thunderstorms happen to be my absolute favorite weather. It has been rainy and cold here the past few days and all I have wanted is a warm bowl of soup and chili. It is like my total heaven. Curling up with a blanket and sipping on soup while listening to the rain. 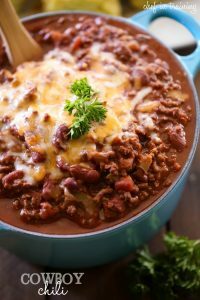 This version of chili was created by my talented mother and packed with flavor and kick of heat and spice- perfect for those chilly and cold days. This recipe is packed with amazing flavor and heat! It is SO good! Brown ground beef. Add onion, bell pepper, garlic and sauté for 1 minute. Add salt, pepper, water, crushed tomatoes, stewed tomatoes, beans, chili powder, cayenne and cumin. Bring to a boil over medium-high heat. Reduce heat and simmer 20 min. If you would like a thicker chili mix ⅓ cup water and 2 Tablespoons masa flour together and add to the chili after it has simmered 20 minutes and cook an additional 5 minutes. Who can resist a good bowl of chili! Looks like a comfort in a bowl. Oh I love chili! I am excited to make this! I love chili too! It is the perfect thing for this time of year. This looks delicious! Oh this looks so hearty and perfect for chilly weather! I can't believe you like rain! I like it for about 3 minutes and then I need my sunshine :) Pinned! That looks yummy! Do you use a salt-free chili powder? If not, can I ask what brand do you prefer? Can't wait to give this recipe a try!! I use half can of refried beans in the chili==or mashed potatoes under the chili in the bowl. What is mesa flour? and if not available, can regular flour, or cornstarch be used to thicken? Waiting and waiting for chili weather here in San Antonio. Maybe tomorrow! My chili recipe calls for mesa flour also. I actually add it before adding any liquids so it doesn't clump up. It adds a delicious flavor to the chili. Going to try your recipe tomorrow! Thanks Nikki for the great chili. This chili is soooo good! I love it, and I'm looking forward to trying some of your other recipes! Hubby on new diet for health reasons...hoping this chili will curb his need for comfort food! Did it all to a tee except used ground turkey instead of beef. Wish me luck! Hubby on new diet for health reasons...hoping this chili will curb his need for comfort food! Did it all to a tee except used ground turkey instead of beef n ommitted salt. Figured he could add it later... Wish me luck! I like your chili recipe. My husband is the chili maker in our house. But I wanted a chili I could make. This is good. My husband even approves. In place of the cayenne, we use our own spice mix. Dried cayenne peppers (maybe other kinds of peppers too) all ground up. Delicious even on fried eggs in the morning! But I love your chili recipe. Will be making this in the months to come. Delish!!! Confused? For thicker chili it should be 1/3C chili powder, (NOT water) and 2 Tablespoons mesa flour. Please confirm. Thanks! I made this recipe as written last Spring and thought it was pretty good. I came back to it a couple nights ago when I really wanted a good bowl of chili and decided to riff on the original a little bit. Instead of stewed tomatoes I used fire roasted diced tomatoes. The stewed tomatoes made it a bit too sweet for my tastes. I also doubled the cumin and used a 12 oz. bottle of Warsteiner Dunkel in place of the water. The dark beer and extra cumin really takes this recipe to the next level, in my opinion. Thank you so much for providing a really good starting point for an awesome bowl of chili. This is a great chili! Went together quickly. I tried to leave out a little of the salt, but nope, it needed all of it. Oh my gosh! I make it pretty much the same way except I use 1 can chili beans, 1 can ranch style beans & 1 can kidney beans. The masa is my secret ingredient, well, not anymore! It's delicious! I make a box of jiffy cornbread with some creamed corn & honey stirred into the mix as well. Perfection on cold, drizzly days! Thank you for this delicious recipe! I followed it almost to a T (I used less chili powder), and it was so incredibly delicious. You helped me make dinner for my husband whose been working so hard lately. I loved that this recipe was easy and super tasty. Thanks again! Should'nt it read masa flour (used in making tamales and tortillas) , not Mesa flour. Been using masa flour in my chili for years. Adds a great ground corn taste. Thanks. I added one extra can of beans, cannellini beans. Browned my chopped 1lb.stew meat in small pieces salted and peppered then browned for 4minutes then added onions,peppers,and garlic chopped finely. Poured this in crockpot. In my sauté pan I added the can tomatoes with water and all the spices then added beans. Then poured all liquids in to crockpot mixed well. Let cook on high for three hours. Made cornbread to go with. I've been using this recipe for a couple years now and wanted you to know how much we like it! I substitute a can of black beans for one of the cans of kidney beans because black beans are my favorite. I also substitute fresh tomatoes for the stewed tomatoes because they go over better here if they are cut up smaller. Overall this is a hearty meal that lasts for a few leftover lunches and it's always been a hit! Thanks for a great recipe that I know I can always count on! Omg me aa my gf love this recipe been making it for a year now...we been using a onion an green an red pepper blend... absolutely the best chilli ive ever had hands dwn! Thanx! We love this recipe!!! I make it in my slow cooker. Love when it gets cold so we can make it!!! The only things that I could improve on in this chili (not that I was asked or anything 🤣🤣) are to simmer it an hour to let the meat tenderize more, and a can of beef broth in place of water, and twice the fresh minced garlic! Otherwise, that is the chili recipe that I use and friends and family LOVE!! This is my favorite chili recipe. I have made it several times and it is loved by all!! I have made this “cowboy chili” several times and it is delicious! My family loves it. FYI: I only put in 1/4 cup chili powder instead of 1/3 cup and it is great.